Trousers with stripes are a fairly young trend. The golden rules for picking this stylish thing are not sufficiently rooted in the female mind. Some women of fashion postpone the purchase of such trousers only because they do not know how to wear them correctly. Contrast stripes on the outside or inside of the pants are an extraordinary detail that makes the image brighter and younger. If on men’s pants stripes emphasize the high status of its owner, then on the women’s point to the top of the style. However, the “strip” pants are quite tricky. An incorrectly chosen combination with other things can play a bad joke, creating the effect of a sports or circus costume. 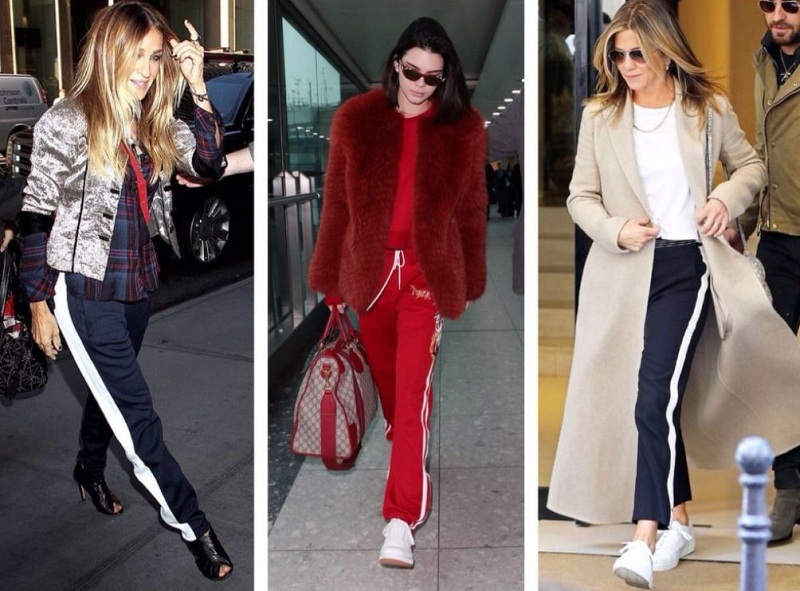 For the first time, the stripes “lit up” on women’s trousers in 2013 thanks to the fashionable home Chloe. Over the past five years, the original trousers have already become classics and form their own wearing culture. We suggest you go on a trip for a stylish outfit on the basis of trousers with stripes. What shoes to wear pants with stripes? Relationship with shoes in this version of women’s pants is ambiguous. Heel fits almost all models, but with sneakers need to be careful. Many strip trousers are associated with recognizable three stripes from the Adidas brand. According to the unwritten code of designers, things from the subject of sports to wear with sports shoes are too trite. Therefore, the “heel + stripes” – a combination of a win-win, and for some models – the only possible. First of all, they include cheeky and feminine pants to the floor, fashionable in the last season. The combination of them with sneakers and sneakers is a clear move. Wide flowing models also like classics: stylish sandals, stiletto heels are perfect for a business or evening look. Shorter trousers with side stripes are less demanding. Style gurus are allowed to synthesize them with a democratic wedge and “lifestyle” sneakers. In the offseason, preference is given to boots and half boots in the color of stripes. Sports shoes are most appropriate to wear with skinny lamp pants, close to skinny. In winter, they look gorgeous in high boots with a wide toe. 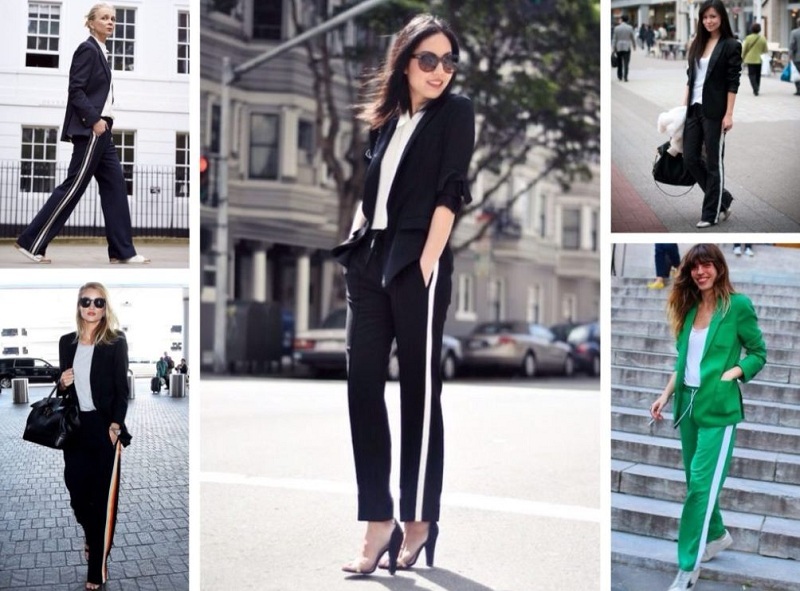 Trousers equipped with side stripes fit well into almost any outfit. No matter where you go: to work, a glamorous party or a romantic meeting, they will serve you well. 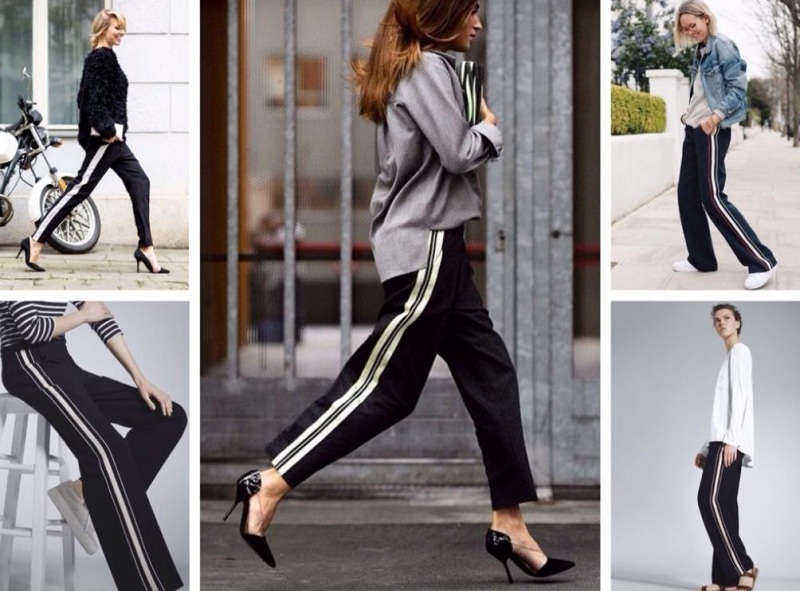 Let us tell you how to organically combine trousers with stripes in a variety of styles. Lamp trousers, as if specially created for an elegant casual outfit. An elegant top or shirt can become its components, in cool weather – a light sweater or poncho. Another interesting version is tight-fitting models with a colored leather jacket. A t-shirt with a V-neck paired with an unassuming jacket over shorter pants with stripes will provide a real wow effect. In the casual version, it will be appropriate to look at white sneakers and sneakers. Lamp pants naturally fit in the military style, from which they came to the world of high fashion. If you are not indifferent to the army wardrobe, wear pants with stripes with strict jackets, decorated with stripes, shoulder straps, trimmed with braid and cords. An organic look will be a khaki shirt. On the photo are fashionable military style bows. As the top fit “militarized” park, overcoat with metal buttons. Suitable shoes – boots with lace, coarse shoes or berets with thick soles; accessories – leather belt and belts with massive buckles. Bags choose a strict rectangular silhouette without excessive decoration. Fans of marginal urban chic for a long time have adopted an informal aesthetic stripe. Baggy jeans, and model best suited to the style of grunge. Wear them with a plaid flannel shirt, jacket, black leather jackets, and sweaters. Provocative orientation grunge image will enhance the legendary Chuck Taylor sneakers or boots of massive Camelot. Women’s sports-style trousers are worn outside the fitness room and treadmill. The top should not contain logos and inlays, emphasizing the athletic focus. It has podium geometry, but not attributes for training. Roll of stripes on a jacket and trousers looks like an interesting reading of a tracksuit. It will surely find its fans due to the combination of style and convenience. The back-story associated with the Adidas brand allows you to wear cotton pants with your favorite T-shirts and T-shirts. The presence of stripes in itself gives the bows a touch of sportiness. Your task is to vary the amount of sport in the image, based on taste preferences. An embroidered bomber jacket or long cardigan will complete a luxury sport-glam bow. A classic oversight jacket will help smooth out the sporty outfit trend. It may have stripes on the sleeves or be neutral monotone. To set the jackpot to the sympathy of others, add his heeled shoes. Mix things from glamor and sports collections, create your own variations of dynamic sports chic. As accessories fit handbag on a chain, a baseball cap, men’s watches. Modern fashion experts welcome a combination of sports and business style. 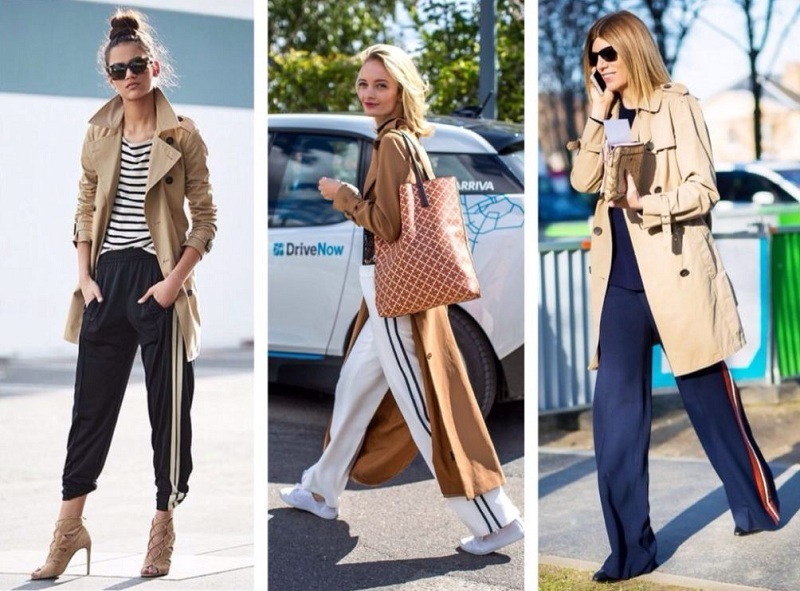 Fearlessly wear lamp trousers with “office” light blouses, blazers, classic coats and trench coats. As for colors, in the trend of business fashion shades of gray, beige, white. A silk scarf will give respectability to a business bow, in which there are stripes. True friends of the weekend trousers with stripes – elegant style and eye-catching decor. Spectacular outfits are made on the basis of skinny black trousers with side seams trimmed with sequins, Swarovski crystals or lace. In choosing the top to this side should be restrained. Open tops, translucent shirts, blouses with open shoulders are not recommended to overload the decor. Top design solutions are embodied by fashion designers in costume expensive fabrics with the addition of silk thread. Even narrow trousers with stripes remain light, emphasizing the dynamics of movement. Unconditional trend 2018 – leather pants with stripes. In this design, sharp contrasts should be avoided. If the pants fit slender girl like a second skin, such a frank image is unsafe to burden with high heels. Otherwise, you run the risk of crossing the invisible boundary of decency. Choose shoes with a flat sole or low-heeled shoes, as shown in the photo. Pants with gold stripes will present a wonderful evening mood – a fashionable innovation in 2018. Judging by the latest shows, couturiers recommend wearing them in a pair with a crop top or a cropped jacket. In exclusive items, stripes are handled manually: decorated with sequins, embroidered with embroidery, and decorated using patchwork technique. This year, pajama outfit with stripes is relevant in bright, electric colors of velvet or silk materials. Loose and soft models of trousers will successfully complement monophonic hoodies, tunics, bodysuits, and T-shirts. Do not forget about comfortable shoes: mules, low-speed shoes, loafers, moccasins. Trousers with stripes – a universal thing for own reading. If you naturally have a delicate taste, create unexpected outfits based on them. Unusual prints, hand finishing, dramatic shoes, and accessories will help to unleash the potential of the trendy fashions. The ability to optimally select the top and shoes by color is necessary for any style. The easiest and safest way is to wear a monochrome outerwear in the main color of the pants or stripes. With this combination, you will receive an additional bonus: the silhouette will visually stretch, and your legs will appear longer. Advanced fashions operate with more interesting options. Try to play on contrasts, using shades that are opposite to the color circle. For example, yellow stripes in a new way will play in a tandem with a purple scarf or print. The most democratic look – black pants with white stripes and vice versa. Bright representatives of the monochrome trend are Escada and Rachel Zoe. Women of elegant age can afford not to violate the image in the style of yin-yang color details, and young girls better to resort to the original interpretation. An active contrast of black with white is too strict for young women. A bright top, for example, a peach or pink coat, helps to balance it. Must accessory for such a set is a compact black-and-white striped handbag. The palm in the fashion industry in 2018 belongs to the models ” on the floor” straight cut. These pants can be mixed with almost any top, choosing the right color scheme. The advantage in choosing shoes for high heels, sports options are more appropriate for shortened pants with stripes. Pop art ornaments, floral prints, “screaming” inscriptions and other spectacular decor are permissible, provided the stripes are not decorated with sequins, embroidery, lace, etc. Heels in combination with stripes will help corpulent ladies to visually stretch the silhouette. 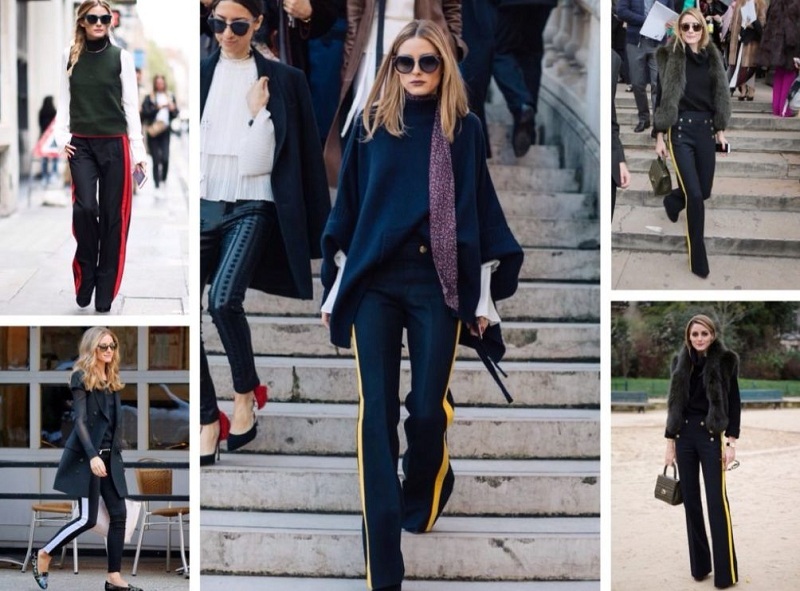 A glorious general past has provided trousers with stripes a great start on fashion catwalks. Fashion stylists promise them no less brilliant prospects in the world of women’s fashion.